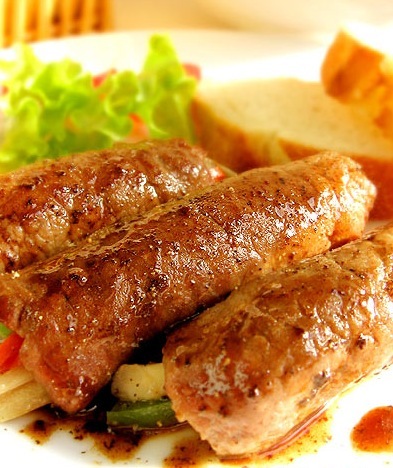 You must have eaten Beef rolls,but of add some red wine ,taste better. And then,pour the oil, first add onion ,mushrooms, green peppers, continue to stir fry, then add spices, cook a few minutes and fish out of vegetables, soup retained. 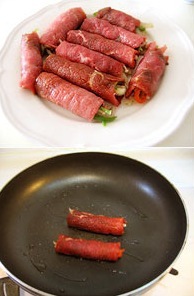 Thirdly,like above pictures,put the last step vegetable into the fried beef rolled beef rolls and sealed with wet starch. At last,fired the beef rolls until mature, and sprinkle black pepper, then transfer to a plate,add the fried vegetables and pour boiled soup. Beef rolls with red wine sauce is finished.